Congratulations to Colleen C., the winner in Susan's giveaway. Thank you to all who participated! Thanks to my wonderful readers! I’m so thrilled to be back. Thank you so much for inviting me! With more than 60 books in a number of genres behind me, I never lose sight of the fact that there wouldn’t have been book 2 without my wonderfully supportive and enthusiastic readers, some who have been with me since day one of my writing career. To say thank you, I came up with the idea of having a Members Only section on my web site for Newsletter subscribers, where there’s one of my Christmas novellas to download, as well as deleted scenes and bios and backstory for characters in my recent books. You can access all that through this link – and I promise not to bombard you with mail! 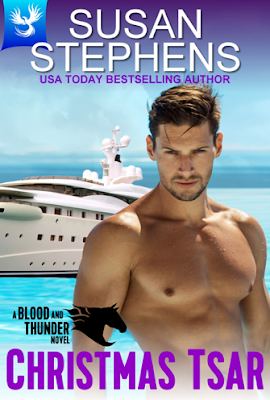 I’m just loving writing my new romantic suspense series, Blood and Thunder. With polo as its underlying theme – or billionaire cowboys, as I prefer to think of my rough, tough guys, this series has another string to it bow, because all the polo players I write about use their international status to work as vigilantes, solving crimes and delivering retribution that other, more conventional agencies don’t have the time or the resources to handle. Here’s my first cover—and my first 5 star review! which is beyond thrilling for me. I hope you enjoy the story, and maybe, if you have time, you could leave a review. It means so much to an author to know that a story I loved writing has made you happy too! Available to buy now, and here are the links. Here’s a scoop just for you—the first page of Argentinian Billionaire – completely unedited, so please forgive me for any errors you find!!! Rose had sixth sense. She knew all about instinct and intuition and why it was vital to pay attention to silent warnings. 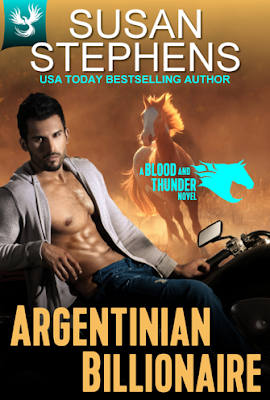 So why, when instinct screamed Keep away from Dante Formosa was he the one man in the Blood and Thunder polo team she wanted to get really close to? He’s done nothing to encourage her. Apart from him being the coldest man on earth, Dante was hardly going to notice a pale Celt in a sea of sloe-eyed beauties. Safe, Rose concluded as she watched the most brutally physical man she’d ever known cast a net of menace over the wedding guests. She worked with his horses every day, so she knew he wasn’t a bad man. It was just that Dante was a force of nature like a storm threatening. But she was in no danger from the storm. Supermodels were more Dante’s style, than women with the tang of the stable about them. It didn’t help that, according to her brothers, she was a spikey, awkward tomboy. Rose was blessed with six brothers: all fierce, all polo players, and all thankfully too far away on missions with Blackheart Security to be in a position to judge her today. If they’d seen her in this lacey girly bridesmaid’s dress with her black hair floating free, as per the bride’s instructions, they’d laugh their heads off. Truth be told, she didn’t go to many parties, and felt awkward at such a high-tone occasion, even though it was on the beach. This marriage between Rose’s friend Amber Smith and Alexei Riga, the Russian billionaire who had founded the Black and Thunder polo team, had attracted the great and good from across the world. And then there was Rose. My Romani Chieftain, Dante Formosa, the billionaire hero of Argentinian Billionaire, has created quite a buzz already—and when you look at this cover, I think you’ll know why. Pre-order now. Release date January 2017. Susan is giving away a signed copy of her latest Presents novel, A Diamond for Del Rio’s Housekeeper, together with her swag, and a special little gift just for you. This giveaway is available globally so that no one is excluded. Giveaway ends 11:59pm EST Nov. 25th. Please supply your email in the post. You may use spaces or full text for security. (ex. jsmith at gmail dot com) If you do not wish to supply your email, or have trouble posting, please email maureen@justromanticsuspense.com with a subject title of JRS GIVEAWAY to be entered in the current giveaway. Thank you Laura - I have to admit 'hard-muscled thighs' have always been a particular favourite of mine!! Congratulations on your latest release! Glad to see that there are more books to come in this series. Thank you. Natlija! I have several more planned, with the next due out around March 2017! Congratulations on your first 5 star review! I have this series down on my want list! I haven't started this series yet but I really like the sounds of it.